Our Ultra Series is a family of floor plans with many features included as standard. The Ultra 7 with the Evolution Bundle includes so much more! A formal foyer entry way welcomes you into the home. 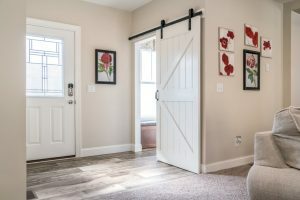 A large closet with built in storage benches is located in the foyer and features a beautiful sliding barn door. Entering the heart of the home you have a view of all the living space! 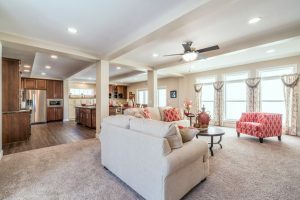 A large Great Room is open into the Kitchen & Nook, with columns and feature ceilings spanning all three rooms. The Great Room has an electric fireplace, ship lap feature walls, great windows for natural light, and a great footprint for furniture layout. The Ultra 7 Kitchen has great storage space, a large center island including the kitchen sink, and dishwasher, a walk-in pantry, built-in microwave, and more! 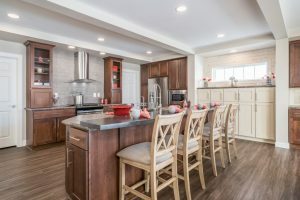 Check out this fantastic Kitchen through our photo gallery and video tour! The Nook also has storage space and entertaining space with the built-in Beverage Center. A 10’ Sliding Patio door is located in the nook as well. The bedroom and bathrooms are all located at the opposite side of the home. The hall bathroom is first, with the two secondary bedrooms are next, and both of these rooms have great closet storage space. The Master Bedroom is located at the end of the hallway, and includes a large walk-in closet and attached Master Bathroom. 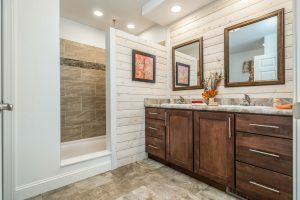 The bathroom features a large walk—in ceramic tile shower, ship lap accents behind the gorgeous framed mirrors, recessed lighting, ship lap towel hook wall, and a linen closet! Take a little time to walk through our Ultra 7 with Evolution Bundle in our new Virtual Tour! This entry was posted in New & Info on March 26, 2018 by hshearer@commodorehomes.com.